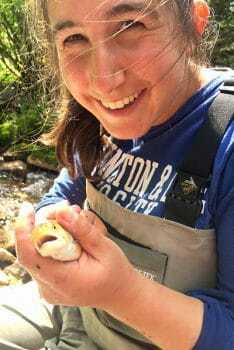 The Intersection Between Psychology and Environment Psychology major Maya Epelbaum worked as an intern at Henry's Fork Foundation in Ashton, Idaho. Organization Size: For the majority of my summer, I worked with a team of 4-8 people from two non-profits (Henry’s Fork Foundation and Friends of the Teton River) doing fieldwork. Each organization had about 10 employees. What attracted you to this internship? Curious about the intersection between psychology and environmental studies, I wanted a summer internship that allowed me to research human impacts on the environment. How did you learn about it? The geology and environmental studies departments sent emails advertising the A. Paul Knight Scholarship. Additionally, I found it on Lexlink and the W&L website. What gave you the edge in landing this internship? As president of Student Environmental Action League, Compost Crew leader, and an Outing Club Trip Leader, I have learned about how we interact with our environment, and want to improve these interactions. While the classes I took for my major and minors helped me understand the importance of this research, I believe my passion for the environment was my most important credential. What were some tasks/projects you worked on? I spent the majority of my time analyzing how the trout population in the Teton watershed changes every five years. To do so, the team used an electro fisher, which temporarily stuns the fish so they are easier to catch and count. The goal of the study was to see if the native cutthroat trout are becoming endangered due to the invasive brook and rainbow trout. Other projects included sampling and testing water quality, analyzing fish migratory patterns up and down the man-made fish ladder along a hydroelectric dam, and preparing for HFF’s annual fundraiser auction. Did any courses and/or professors help you prepare for this internship? Environmental Ethics with my philosophy advisor Professor Cooper helped me realize that there is nothing straightforward about conserving the environment. He inspired me to find research opportunities to try and figure out more about what it means to treat the environment ethically. What did you learn from your experience? I learned that conservation is not just keeping the ecosystems the way they are meant to be because there is no “way they are meant to be.” Rather, it is finding a balance among the competing needs of industries, ecosystems and anyone else impacted by the conservation efforts. What was your favorite part or perk of the internship? During the workweek I bushwhacked through the most glorious views in the Teton Mountains in the Wydaho (Wyoming and Idaho) area. I’d then go explore these same areas on weekends. That my work and recreation consisted of the same activities is the best perk a job could ever have. What did you learn from city where the internship was located? The “city” of Ashton has three grain elevators, a few old-fashioned soda shops and fly-fishing stores. No chains, few people, and no nightlife. At first I craved civilization, but by the end of the summer, the people I met, places I saw, and nature I became a part of made me realize you do not need a city to have a great time. What key takeaways/skills are you bringing back to W&L? This summer I pushed my limits — both mental and physical. I overcame my fears by bushwhacking through treacherous hills with a fifty-pound electro fisher on my back, and learned through experience. What advice would you give to students interested in a position like this? Be open-minded and ready to stretch your mind and body to the fullest. Has this experience influenced your career aspirations? How so? It opened up a field of careers outside the bounds of city offices.